P1 Photo etch Union Insignia. Ideal for enhancing and super detailing figures from the Kit range. Replace existing belt buckles and insignia with a different type of buckle. 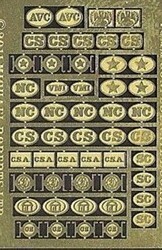 P2 Photo etch Confederate Insignia. Ideal for enhancing and super detailing figures from the Kit range. Replace existing belt buckles and insignia with a different type of buckle. 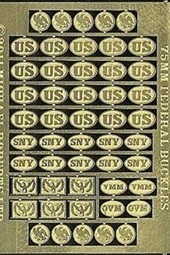 P3 Photo etch Federal Belt buckles and cartridge box plates. Ideal for enhancing/converting and super detailing figures from our kit range. 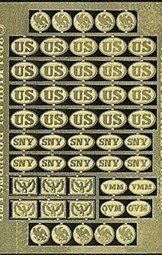 This set contains 6 different types of Union buckles including some State variations. P4 Photo etch Confederate belt buckles and cartridge box plates. Ideal for enhancing/converting and super detailing figures from our kit range. This set contains 13 different buckles including some State variations. P5 Photo etch 75mm Federal belt buckles and cartridge box plates. Ideal for use in converting FER and Scale 75mm ACW figures. This set contains 6 different types of Union buckles including some state variations. P6 Photo etch 75mm Confederate belt buckles and cartridge box plates. 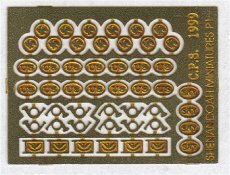 Ideal for use in converting FER and Scale 75mm ACW figures. 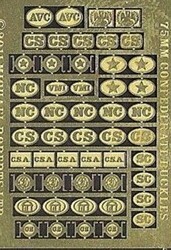 This set contains 13 different types of Confederate state buckles and cartridge box plates.